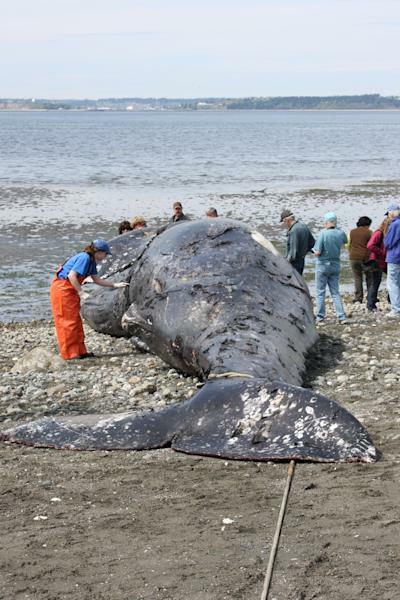 SEATTLE (AP) — A gray whale found dead in Washington state's Puget Sound had been feeding on shrimp and also had some debris, including a golf ball, in its stomach, but scientists don't know what killed the animal. The stomach examination Monday found the shrimp, woody debris, algae, pieces of rope and plastic, the golf ball and some flat spongy material, NOAA Fisheries said. The garbage was minimal and not the cause of death, which remains under investigation with tissue tests, spokesman Brian Gorman said. It's common for whales to pick up debris near urban areas because they are filter feeders. There were no signs of trauma or entanglement on the whale, he said. The carcass was spotted Sunday on the west side of Camano Island and towed to a secure location at the Whidbey Island Naval Air Station, about 50 miles north of Seattle for the necropsy by biologists and volunteers from Cascadia Research, Washington Department of Fish and Wildlife, and the Central Puget Sound Marine Mammal Stranding Network. The skeleton of the 37-foot sub adult male will be cleaned and sent to the Smithsonian Institution. "We don't get these that often that are the right size and in good shape," Gorman said Tuesday. 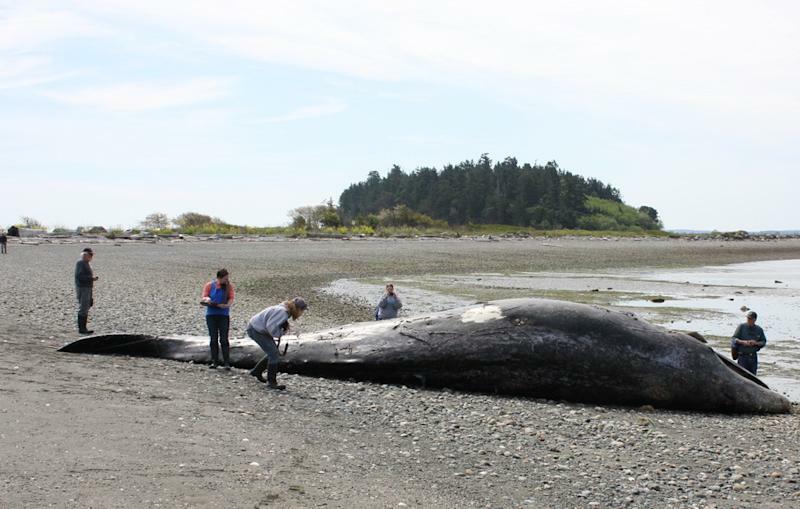 A representative of the Smithsonian will help oversee the cleaning, said Kristin Wilkinson, marine mammal stranding coordinator for the Northwest region with the National Oceanic and Atmospheric Administration. Whale skeletons, baleen and other marine mammal bones or seal and sea lion pelts, are commonly made available to schools or institutions for education and outreach, she said. Even with results of tests for contaminants and diseases, the cause of the Camano whale's death may never be known, Wilkinson said. "Sometimes we're able to put pieces of the puzzle together and other times those samples don't shed any light on cause of death," she said. 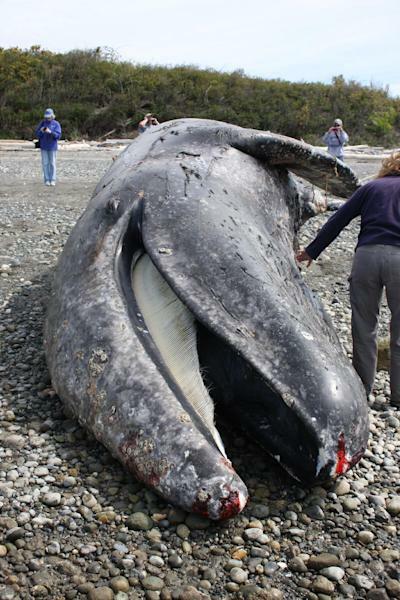 The Camano whale's death is unusual because the body was in good condition with oily blubber. The two to 10 gray whales that typically die each year in Washington waters usually are in poor health or have lost weight. "It's puzzling, there's no apparent cause of death," said John Calambokidis of Olympia-based Cascadia Research. "It doesn't seem to be the typically emaciated animal we normally see," said Calambokidis, who often responds but was not with the Cascadia Research group that helped with the Camano Island whale. He noted there was less debris in the whale's stomach than in a whale that was found dead off west Seattle in April 2010. Its stomach contents included plastic bags and a pair of sweat pants. That whale's skeleton was preserved and is now on display at Highline Community College's Marine Science and Technology Center in Des Moines. The Camano whale is the third stranded gray whale in Washington so far this year and the first in inland waters, NOAA Fisheries said. The gray whales most often die during the spring months during the migration from their breeding grounds off Baja California, Mexico, to feeding grounds in the Bering Sea, off Alaska. Gray whales can pick up debris because of the way they feed, scooping up sediment from the sea floor and filtering it through baleen. They eat ghost shrimp in Washington waters, Wilkinson said. "Whatever trash and debris sitting on the sea floor in that sediment is trapped inside the mouth, and it will then swallow," she said.